This morning, we released version 2.2 of Sandvox. It’s available for immediate download or via the Mac App Store. One of the features we’ve added in 2.2 is a new Text inspector. This allows for bulleted or numbered lists. There are also a number of other text editing improvements, including strikethrough formatting and both left-to-right and right-to-left writing directions. Sandvox 2.2 also features a new Map object. 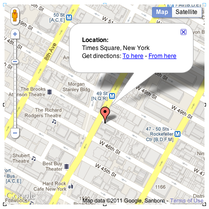 Now you can place an interactive map, powered by Google, right on your website to help web visitors find you in the physical world. The Object inspector offers several options to customize the map for your needs. We’ve continued to improve publishing with each new update to Sandvox, and version 2.2 is no exception. This latest update improves compatibility with a number of SFTP servers, and solves some issues with WebDAV and MobileMe publishing. There are a number of document management improvements, enhancements to editing raw HTML, and other fixes. We’re sure you’ll love the new 2.2 version! Download it now. It was just two weeks ago that we announced the availability of Sandvox on the Mac App Store, and to say that it was a success would be an understatement! Due to some dynamite placement on the App Store (Thanks Apple! ), including a giant banner visible upon launching the store all over the world, Sandvox was one of the top-grossing applications. We have a lot of new Sandvoxers now, thanks to the Mac App Store. If you are one of them, welcome! Mac App Store purchasers, would you mind going to Sandvox's App Store page, dragging across next to “Rate this application” to give Sandvox some stars, and maybe writing a brief review? (Click “Write a review”.) Thanks! We often find that darker background websites are preferred by artists and photographers as a way to make their images “pop” off the page. 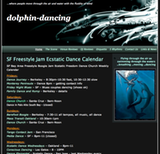 Geoff Laplace has effectively grasped this concept to enhance his logo image at his comprehensive Bay Area dance website. He selected a design that meshes perfectly with his theme. Having previously used Dreamweaver (“nightmare”) and iWeb (“not my finest hour”), Robin Taylor was delighted to encounter the ease of setup and utilization he experienced with Sandvox. 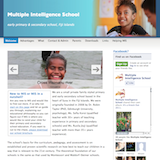 He was attempting to promote his progressive holistic primary school in Fiji, a byproduct of his behavioral research in the developing regions of the world. What he did not expect was the search engine ranking value that accompanied his design efforts. Mr. Taylor states, “Our biggest surprise is that, aside from word of mouth, our website is our biggest lead generator in terms of introducing us to new potential parents.” We hear that a lot and we are proud to be able to offer websites that perform beyond appearances. Ultimately, the design features and aesthetics of any website should function as tools to enhance the product, service, or information offered, not to be the dominant presence of the site. 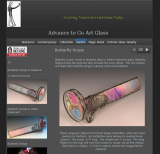 Geri Omohundro understands this concept and has developed a website to promote her unique and magnificent kaleidoscopes and other glass art pieces. Ms. Omohundro plans to add YouTube videos to her site to literally bring the viewing experience of her scopes to directly to potential buyers right in their homes. With a fully functional shopping cart and free shipping within the United States, her upcoming Christmas season will likely keep her busy!